Scenes from the 2017 Business Innovation Expo of Western Mass. 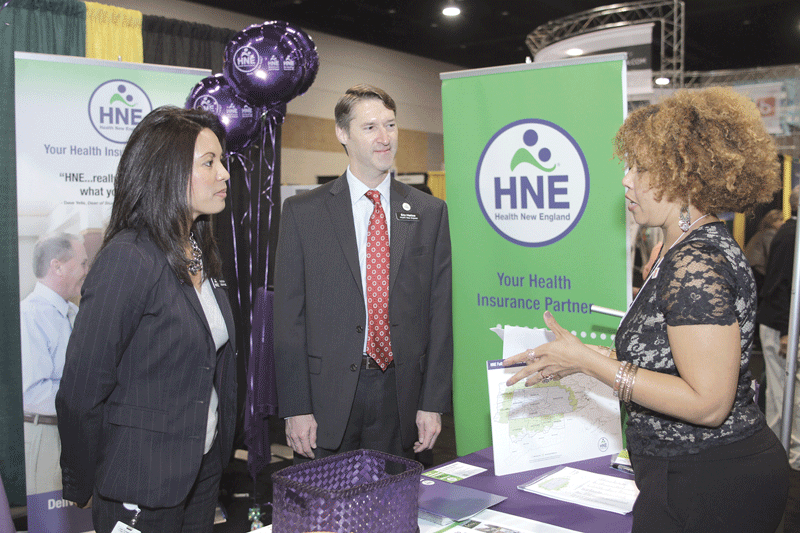 The Business & Innovation Expo of Western Mass., the annual show produced by BusinessWest and the Healthcare News and presented by Comcast Business, drew nearly 150 exhibitors and 2,000 visitors to the MassMutual Center on Nov. 2. 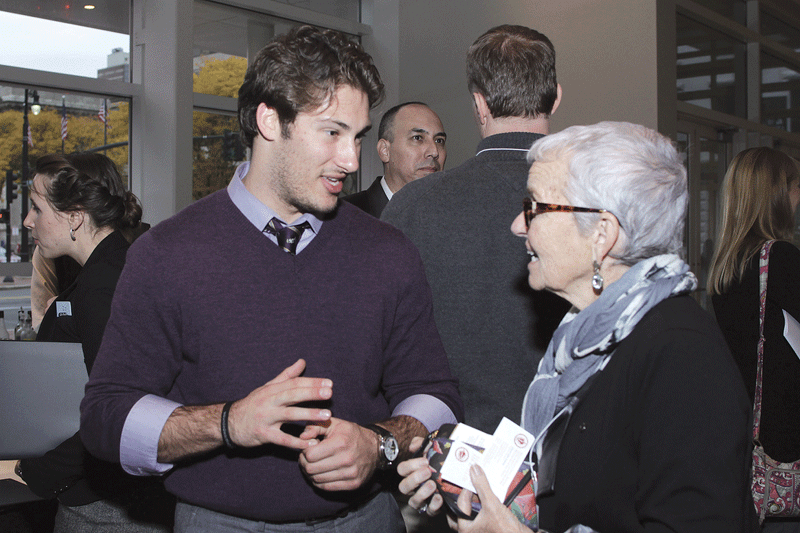 They enjoyed a series of educational seminars, breakfast and lunch programs, a day-capping Expo Social, and much more. Take a look through the photo gallery below for a recap of all the excitement, insight, and innovation. 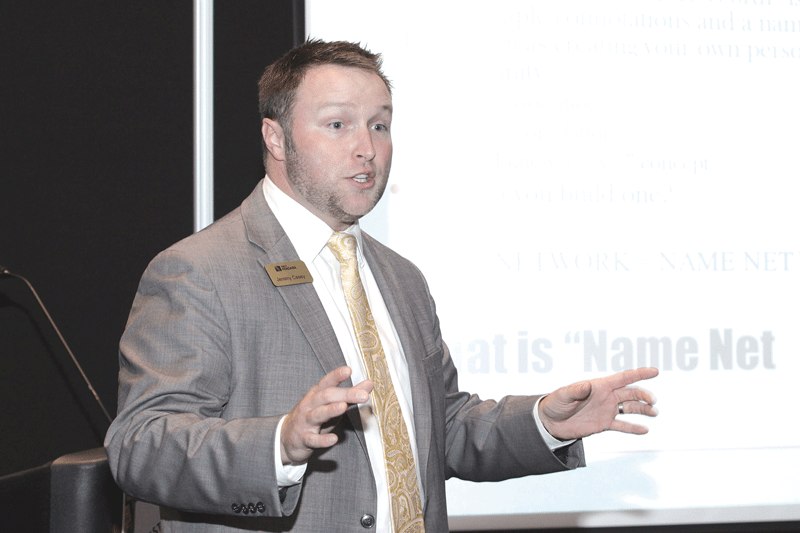 It’s a subtle name change, but a rather large adjustment in tone for what has become a fall tradition within the region’s business community. Indeed, the annual show at the MassMutual Center in downtown Springfield is now known as the Business & Innovation Expo of Western Mass., and this change — the addition of that word ‘innovation’ on the marquee — speaks volumes about the business-to-business show’s new and expanded mission, said Kate Campiti, associate publisher of BusinessWest, which has managed the show since 2011. Elaborating, she said the Nov. 2 show, still very much in the planning stages, will be, in effect, a showcase of innovation and the many forms it takes in a changing, highly competitive business climate. 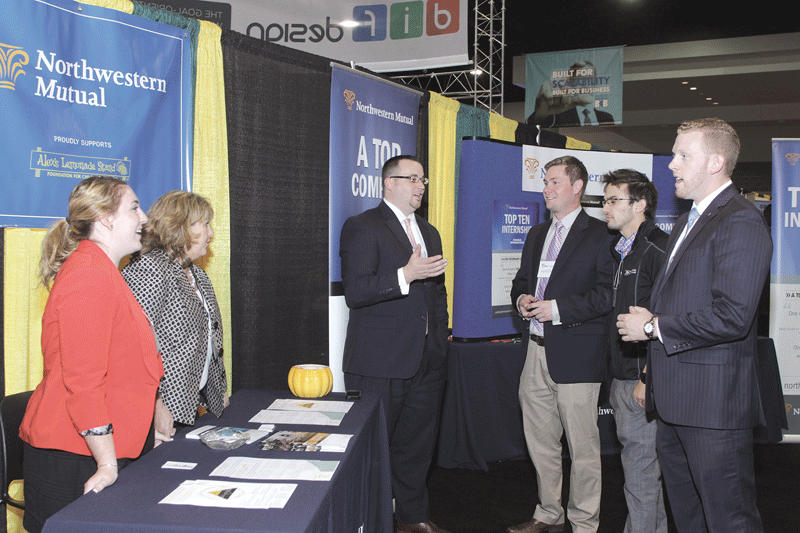 Once again presented by Comcast Business, the Expo has become a fall tradition in Western Mass., attracting more than 2,000 visitors and more than 150 exhibitors to the MassMutual Center. 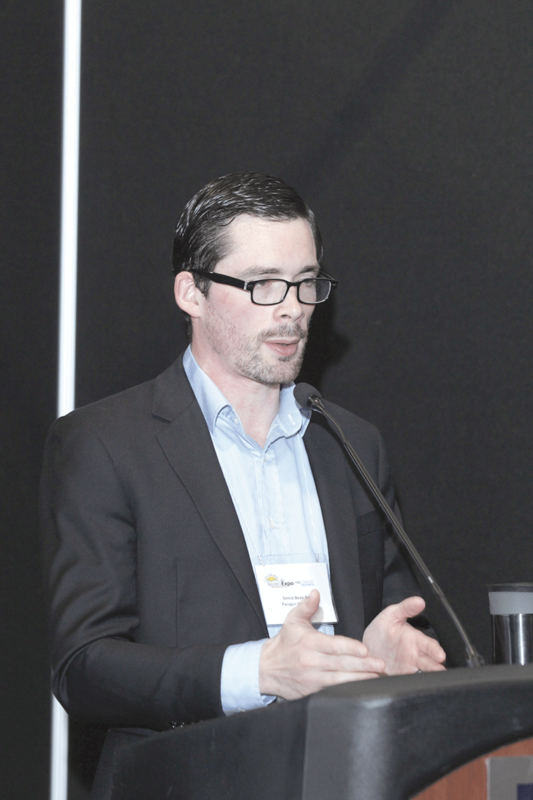 As always, there will be a strong business-to-business component to the show, said Campiti, adding that the event provides opportunities for businesses to showcase their products and services, and for these businesses and attendees to make important connections. But there will be an educational component as well, she said, and much of the focus will be on innovation and the many forms it takes. “People tend to think of innovation as new-product development, and that’s a big part of it,” she noted. “But there is information in all aspects of business — from process improvement to how companies attract and retain talent; from the use of technology to make a business more productive and efficient to development of systems to not only generate ideas but cultivate them into advances; from how an emergency room handles peak traffic flows to how a bank safeguards its customers from fraud. 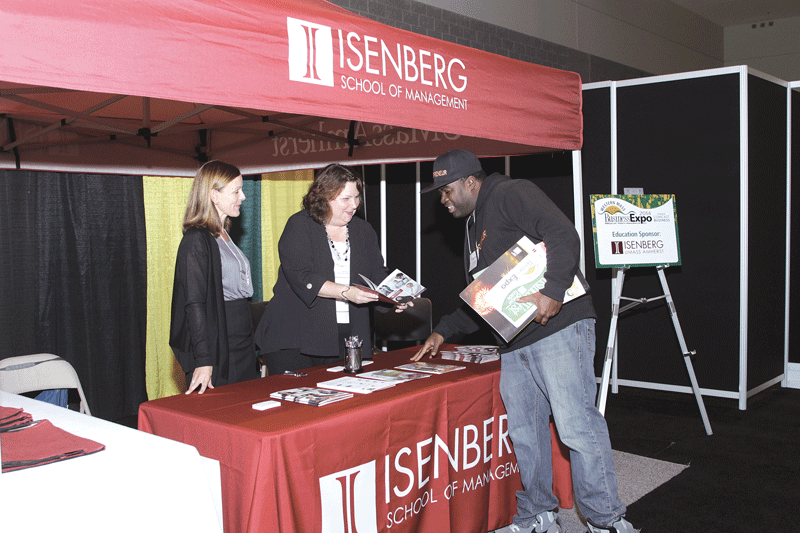 In addition to Comcast Business as presenting sponsor, Inspired Marketing is the show partner, MGM Springfield is participating as corporate sponsor, the Isenberg School of Management at UMass Amherst is the education sponsor, and the Better Business Bureau is a contributing sponsor. Additional sponsorship opportunities are available. Details of the show will be presented in upcoming issues of BusinessWest and online HERE. For more information on the show, to register, or to request information on becoming a sponsor, visit the website or call (413) 781-8600. 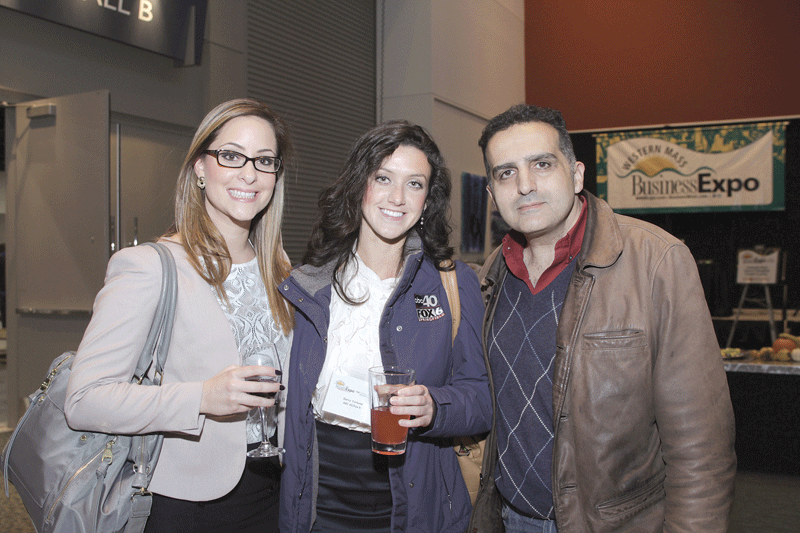 More than 2,000 people ventured to the MassMutual Center in Springfield on Nov. 3 for the 6th Annual Western Mass. Business Expo. The day-long show featured a wide variety of informative and entertaining programming, on subjects ranging from drones to virtual reality; motivating Millennials to robotics; entrepreneurship to search-engine optimization. 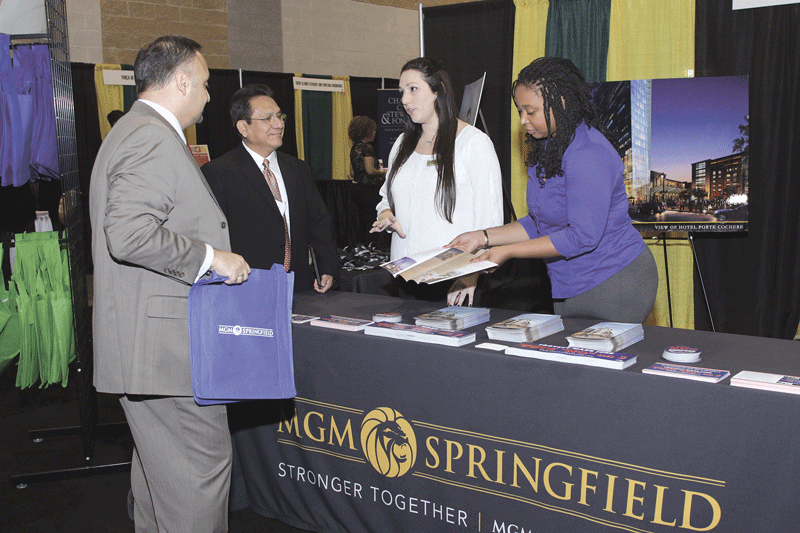 The Expo kicked off with a breakfast staged by the Springfield Regional Chamber of Commerce, and ended with the popular Expo Social. In between were seminars, more than 100 exhibitors, a pitch contest, lunch hosted by the Professional Women’s Chamber, an ice cream social, and much, much more. In the gallery below, BusinessWest offers a pictorial review of the show, capturing many of the sights of an unforgettable event. The NextGEN gallery with ID/slug: 17 does not exist or is empty. 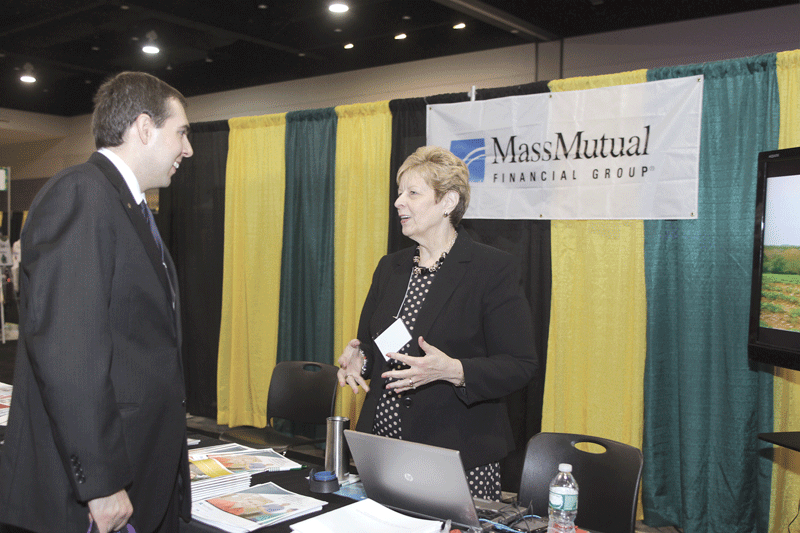 More than 125 exhibitors and 2,500 attendees packed the MassMutual Center in Springfield on Nov. 4 for the fifth annual Western Mass. 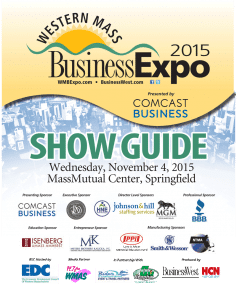 Business Expo, presented by Comcast Business and produced by BusinessWest and the Healthcare News. The event featured 16 educational seminars; corridors dedicated to robotics, healthcare, and retail; the annual Pitch Contest staged by Valley Venture Mentors; a Business Support Center offering myriad resources to business owners; breakfast and lunch programs; the day-capping Expo Social; and more. 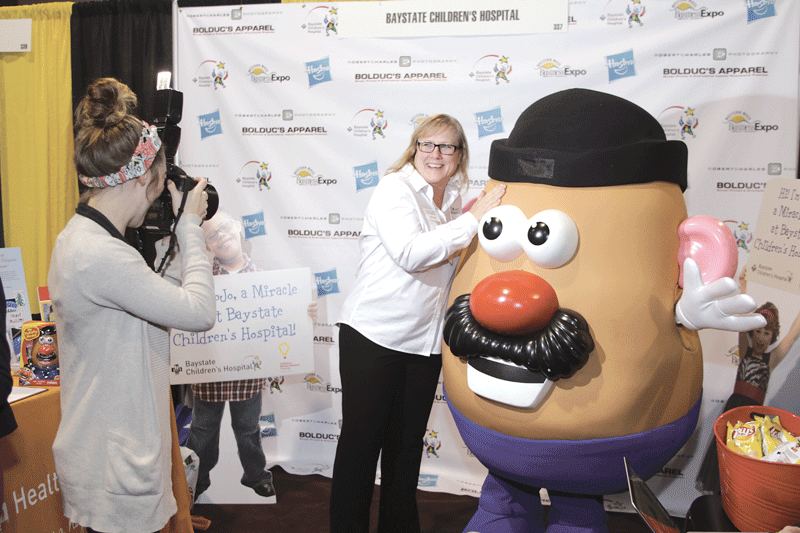 And by big, Kate Campiti, associate publisher of BusinessWest, means big. That’s the easiest and perhaps the best way to describe the fifth edition of the Western Mass. Business Expo, produced by BusinessWest and HCN. It will be big in terms of size and scope — more than 2,500 attendees are expected, and there will be more than 125 businesses exhibiting — and also in its impact when it comes to showcasing the region’s business community and providing the invaluable insight needed to thrive in an increasingly competitive global economy. And, as always, it will be very big with regard to creating networking opportunities. The show, which will kick off with the Springfield Regional Chamber’s November breakfast, featuring keynoter Dan Kenary, CEO and co-founder of Harpoon Brewery, will feature more than eight hours of programs that will be informative, educational, and inspirational, and will bring together popular elements from Expos past and introduce some new ones. In that first category, will be informative seminars, more than dozen of them, in tracks ranging from sales and marketing to ‘hottest trends’; a popular retail corridor; a pitch contest staged by Valley Venture Mentors; and the event-capping Expo Social, one of the region’s best networking events. In that latter category will be a multi-faceted focus on the region’s precision manufacturing sector and the workforce challenges facing it. That focus includes robotics and machine tooling demonstrations; exhibits created by area vocational students on the various tools or their trade and ongoing efforts to forge partnerships with area manufacturers; and a luncheon program featuring Alison Lands, senior manager in Deloitte’s Strategy & Operations practice. She served as a co-author and editor of the New England Council and Deloitte’s recently published report, Advanced to Advantageous: The Case for New England’s Manufacturing Revolution, and her talk will be focused on that document. This year’s pitch contest will have a new and intriguing twist. This year’s event, which represents a partnership between VVM, the Economic Development Council of Western Mass., the Small Business Administration, and entrepreneur sponsor Meyers Brothers Kalicka, will feature the debut of the InnovateHER pitch competition. The InnovateHER Challenge is a national prize competition aimed at unearthing products and services that impact and empower women and families through local business competitions. 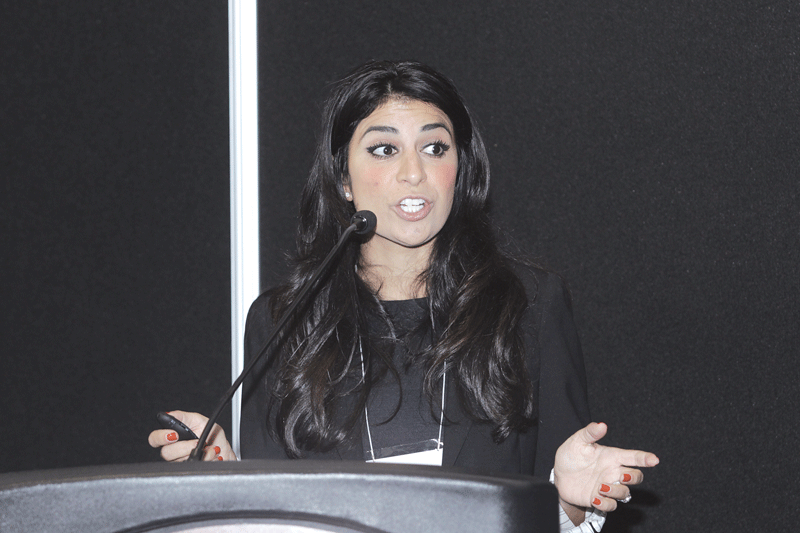 The winner of the Nov. 4 VVM Pitch Contest will advance to the next round of the national InnovateHER competition, with a chance to compete for $70,000 in prize money. Expo attendees will have the opportunity to choose which of those five they think will prevail in the competition. Those who guess correctly will win a beverage for the social. The region’s healthcare sector will be prominently displayed at the Expo, with a designated corridor. It will be populated by Holyoke Medical Center, HealthSouth, MedExpress Urgent Care, Porchlight VNA/Home Care (which willk be offering flu shots), Ex Physical Therapy, and many other area companies. A returning feature will be the Retail Corridor, which made a popular debut in 2014. It will feature a host of area companies featuring holiday gift items in a range of categories, from therapeutic massage to chocolate; cosmetics to jewelry; fruit baskets to Springfield Falcons tickets. Meanwhile, new this year is the Business Support Center, which, as that name would suggest, features a number of exhibiting economic-development-related agencies that exist to support business owners and managers. 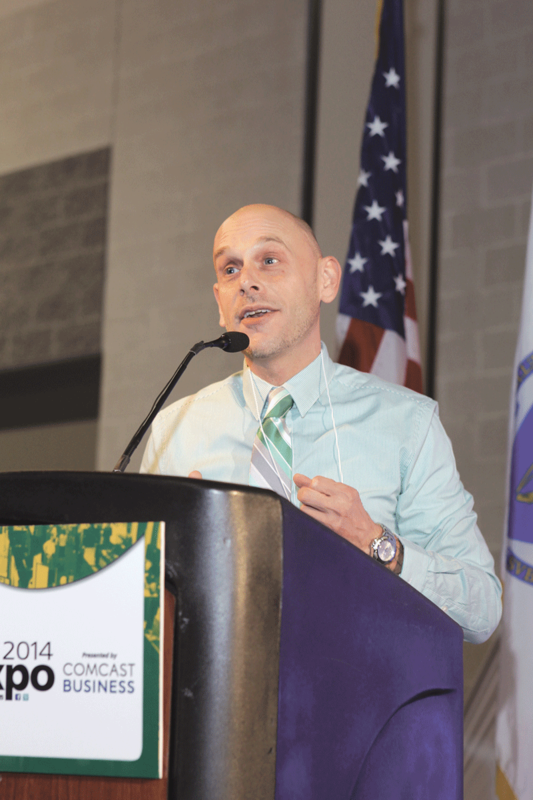 Participating agencies include the Economic Development Counsel of Western Mass., the Mass. Office of Business Development, the Kittredge Center at Holyoke Community College, the Mass. Export Center, the Holyoke Innovation District, and the Mass. Small Business Development Center, among many others. 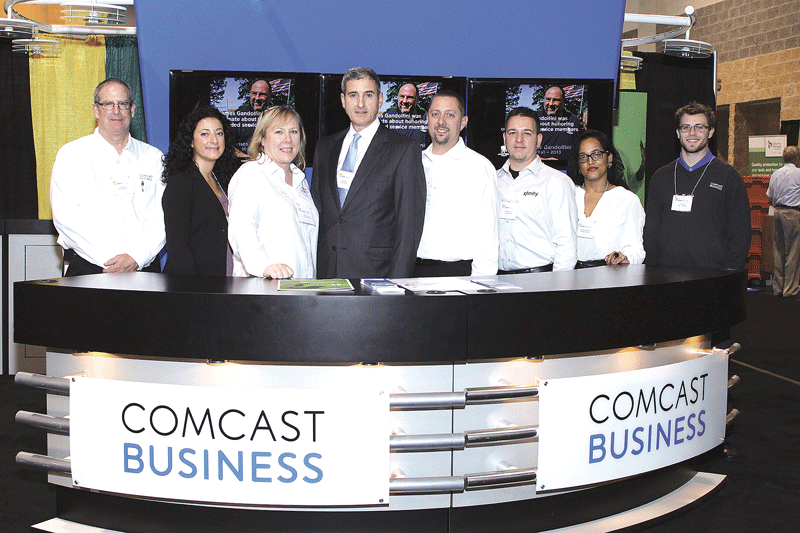 The Expo will again be presented by Comcast Business, which has been the show’s lead sponsor since HCN and BusinessWest began producing it in 2011. Director-level sponsors are Health New England, Johnson & Hill Staffing Services, MGM Springfield, and Wild Apple Design Group. The Isenberg School of Management at UMass Amherst is the education sponsor, 94.7 WMAS is the media sponsor, Peerless Precision, Smith & Wesson, the NTMA, and the Larry A. Maier Memorial Educational Fund are the Robotics and Manufacturing sponsors, and Meyers Brothers Kalicka is Entrepreneur sponsor. “Oscar’ the robot will be putting talents on display at the Western Mass. Business Expo on Nov. 4. 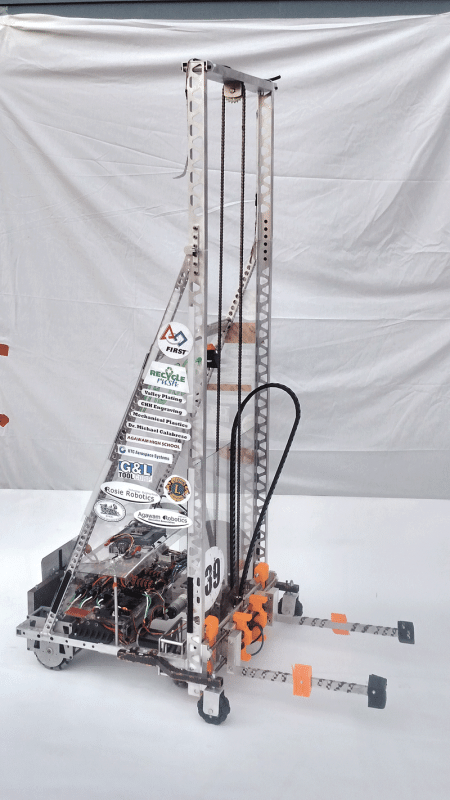 One of those tags will require just a single word: ‘Oscar.’ That’s the name given to the robot created by a team of Agawam High School students for a FIRST (For Inspiration and Recognition of Science and Technology) Robotics Competition staged earlier this year. FIRST, an international, K-12, not-for-profit organization founded to inspire young people’s interest and participation in science and technology, said there were more than 3,000 entries, including Oscar, for a competition, or game, called Recycle Rush. As the name suggests, these robots were programmed to stack storage totes and recycling bins; Oscar ranked 65th in New England, just missing qualifying for the NE FIRST District Championships by five points. Oscar, created by a team called ROSIE (Recognizing Outstanding Science-inspired Education) Robotics, will be putting his various talents on display at the Expo — show attendees may actually get an opportunity to take the controls — thus playing a significant role in a multi-faceted effort to spotlight one of the most important sectors of the region’s economy, precision manufacturing, and the many challenges facing it. 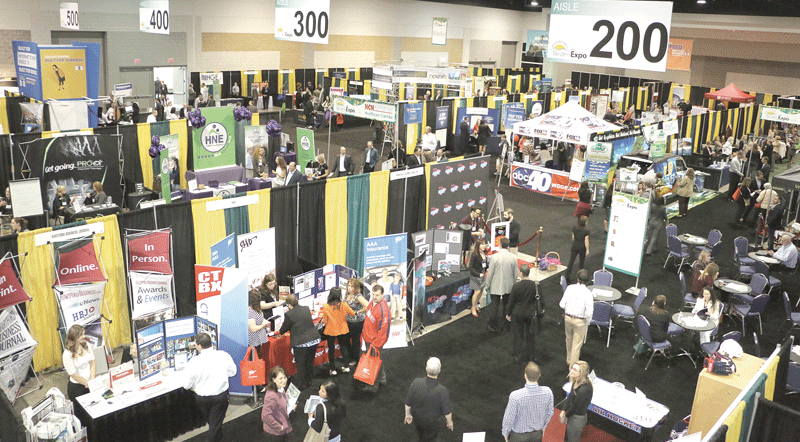 Indeed, while the Expo will showcase virtually every sector of the local economy — from banking to retail; healthcare to technology; education to tourism — this, the fifth edition of the show, will feature a number of programs and exhibits focused on manufacturing and efforts to return this once-proud industry to prominence in the region. Individual elements of this focus on manufacturing and the workforce issues it now faces include a luncheon program hosted by the Professional Women’s Chamber of Western Mass. The keynote speaker will be Alison Lands, senior manager in Deloitte’s Strategy & Operations practice. 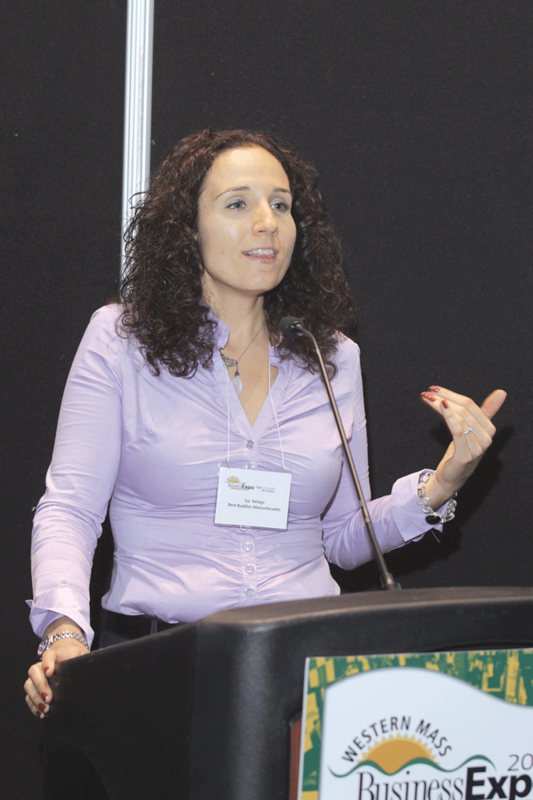 She served as a co-author and editor of the New England Council and Deloitte’s recently published report, Advanced to Advantageous: The Case for New England’s Manufacturing Revolution, which will form the basis of her talk. It will also include participation by several area high schools, which will be spotlighting not only robotics, but also their machining programs, which play a vital role in maintaining a steady flow of workers to area manufacturers. In addition to Agawam High School, Putnam Vocational Technical Academy and Westfield Vocational Technical High School will be taking part in the show. They will be showing off display computers, 3-D printers, and other equipment, and providing simulations of precision-manufacturing processes. 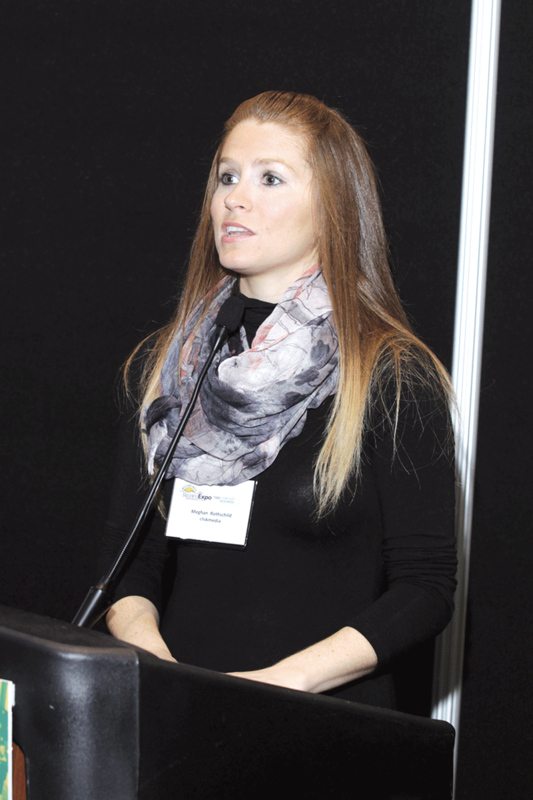 The focus on this sector is critical, said Kristin Maier Carlson, president of Westfield-based Peerless Precision Inc., who noted that many young people — and their parents, unfortunately — have a perception of manufacturing that is outdated and inaccurate. She said that, while running operations at Peerless, she’s also on a mission to help people get an accurate look at her industry and perhaps become motivated to join it. Actually, her work is a continuation of her father’s mission to achieve that same end. Larry Maier acquired Peerless in 1997, and years later took a leadership role with the National Tooling & Machining Assoc. (NTMA) and its efforts to educate several constituencies about precision manufacturing with the goal of securing an adequate future workforce for shops here and across the country. When her father was diagnosed with colon cancer, Maier Carlson, who said she grew up working at the shop sweeping floors and later cutting material on a band saw, returned to this region from San Diego to help determine its future course. By the time Larry succumbed to the disease, she had made up her mind not to sell the operation, but lead it to new heights. While doing so, she is continuing her father’s work in education and building a workforce, and currently playing a leadership role at the NTMA. As part of that, she and other family members created the Larry A. Maier Memorial Educational Fund to help carry out the task of enlightening young people — especially those at the middle-school and even elementary-school levels — about the opportunities in manufacturing. Money from that fund will be used to offset the costs associated with bringing the various high schools to the Expo and enabling them to show how their programs are both creating job opportunities and helping area manufacturers tackle the challenging workforce issues confronting them. As for Oscar, he will be one of at least two ‘competition robots’ that the ROSIE team will bring to the Expo, said Dana Henry, chief mentor for the team, adding that he expects these machines to turn some heads, impress attendees, and bring attention to careers that fall in the broad category called STEM — science, technology, education, and mathematics. 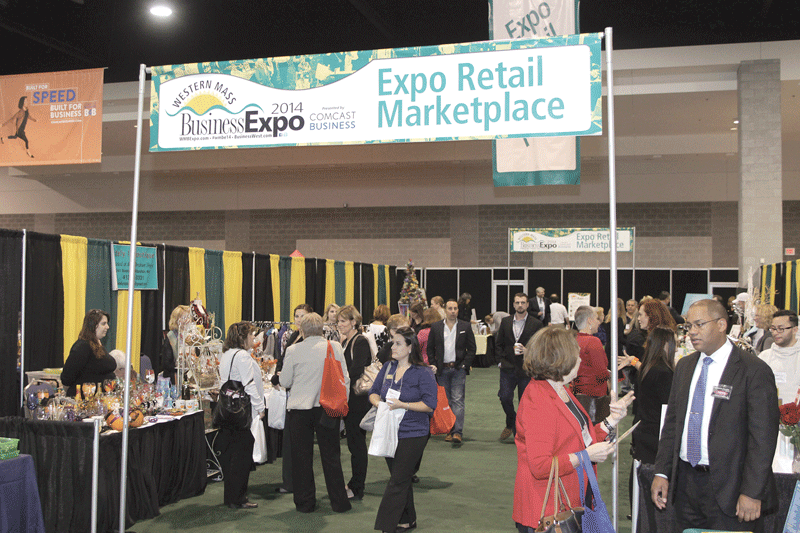 As will many other aspects of an Expo that has added a number of compelling elements to this year’s itinerary. 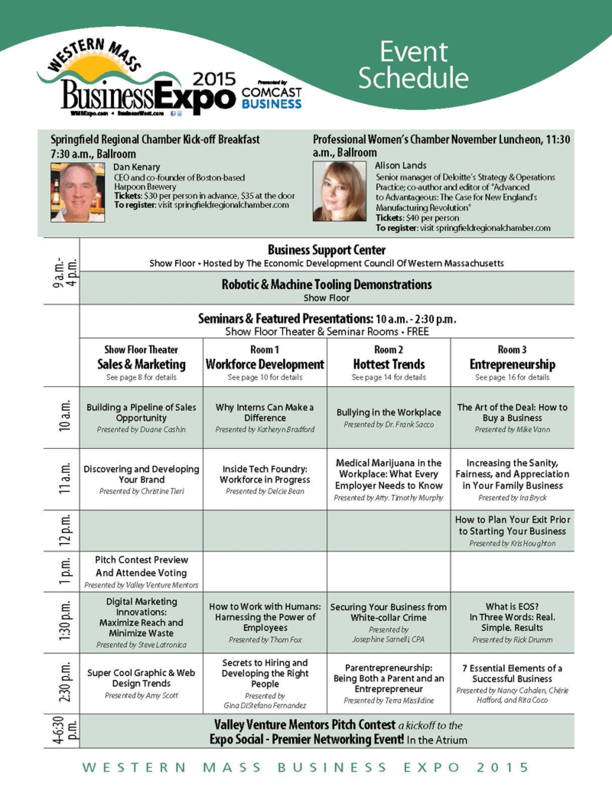 Visit www.wmbexpo.com for more information and to register. 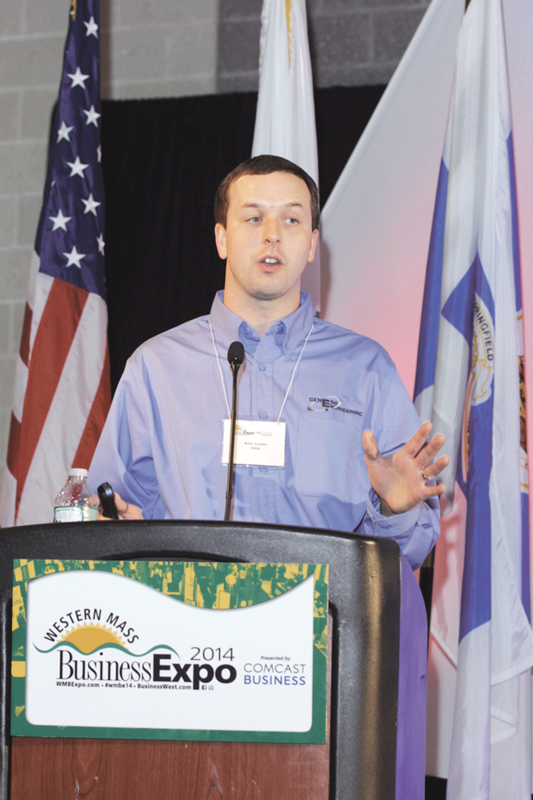 Since it was launched in 1984, BusinessWest, known back then as the Western Mass. Business Journal, has been on a mission — not only to hold up a mirror to the region’s business community, but to serve it through editorial content and programming that’s informative, thought-provoking, and often entertaining. 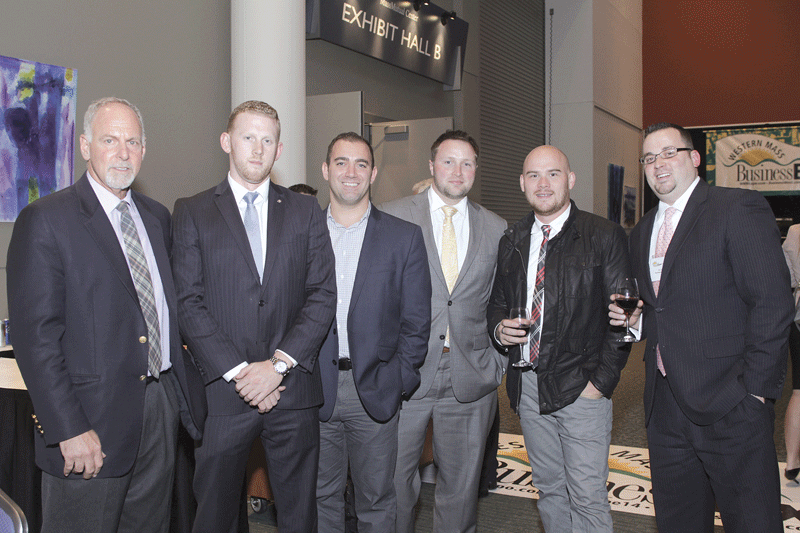 The process of fulfilling that mission has changed with the times, and involved new avenues for communicating with, and engaging, the business community of Western Massachusetts. 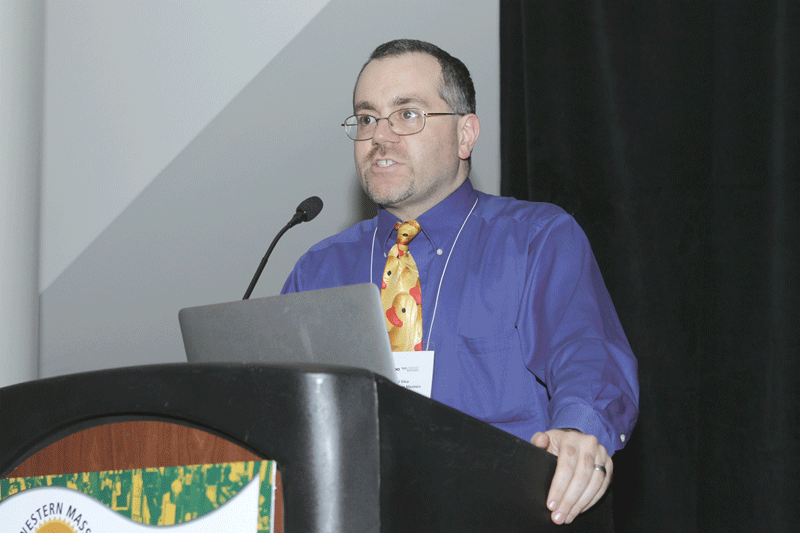 Examples of this evolution include everything from doubling the magazine’s frequency from monthly to bimonthly to launching a separate publication, the Healthcare News, devoted entirely to that sector; from putting content online to launching recognition programs, including 40 Under Forty and Difference Makers. 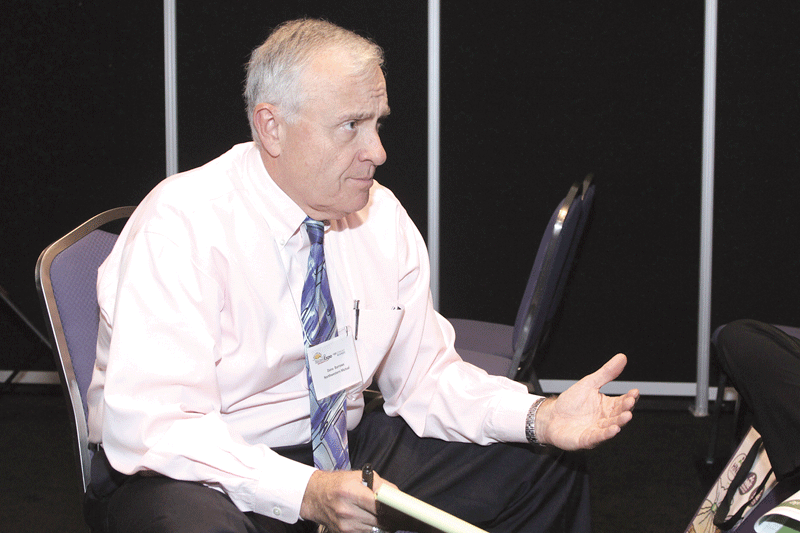 The latest step in this evolutionary process came in 2011, when BusinessWest determined that, despite ample evidence to the contrary, the era of the large-scale, business-to-business trade show wasn’t over. 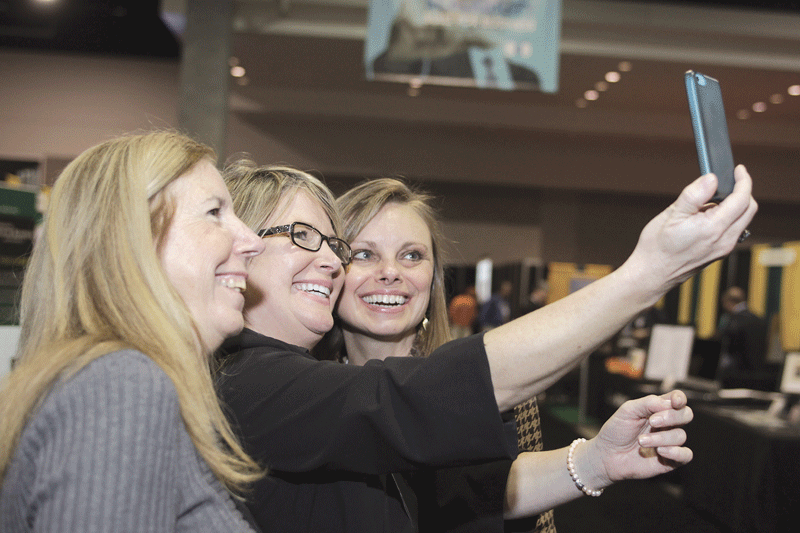 Rather, we decided it was time to enter a new era — one where the show would become bigger, broader, and even more focused on providing value for exhibitors and attendees alike. Thus, BusinessWest created the Western Mass. Business Expo, and has spent the past four years refining and enhancing a quality product. The fifth edition of the show reflects these efforts. 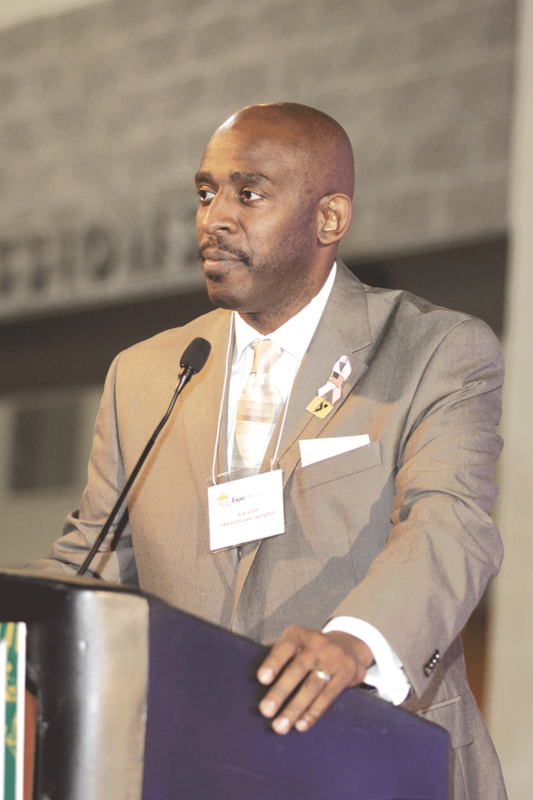 The day-long event is crammed with programming designed to promote awareness of the depth and breadth of the region’s economy and help business owners and managers better navigate the myriad challenges they face. 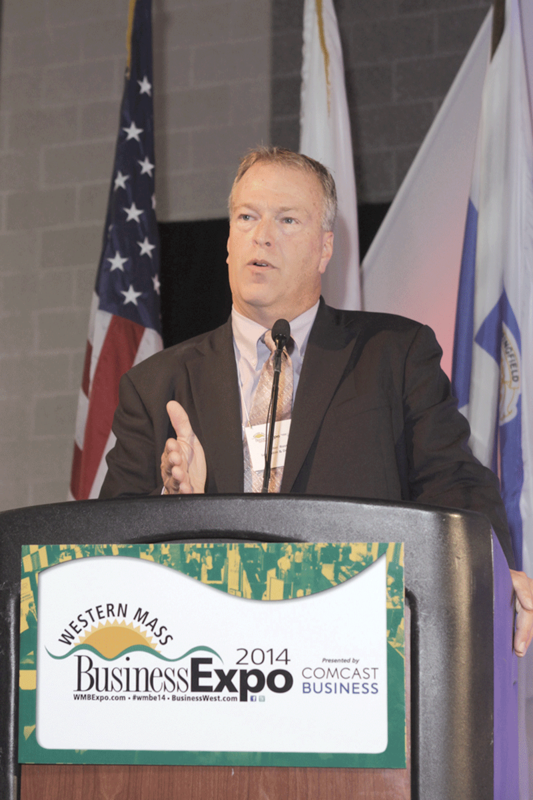 The day will get off to an entertaining start with the Springfield Regional Chamber’s October breakfast and keynote speaker Dan Kenary, CEO and co-founder of Harpoon Brewery, who will engage in a “casual conversation” with BusinessWest Editor George O’Brien. Later, at the luncheon hosted by the Professional Women’s Chamber, Alison Lands, senior manager in Deloitte’s Strategy & Operations practice, will present a program based on a report she co-authored and edited titled “Advanced to Advantageous: The Case for New England’s Manufacturing Revolution.” She will discuss the challenges facing this resilient, innovative sector, particularly a persistent skills gap and a lack of brand awareness, and how they present real opportunities for workforce development in New England. If you’re invested in manufacturing, you’ll want a seat at this event. Throughout the day, there will be informative seminars across four tracks: Sales & Marketing, Workforce Development, Hottest Trends, and Entrepreneurship. 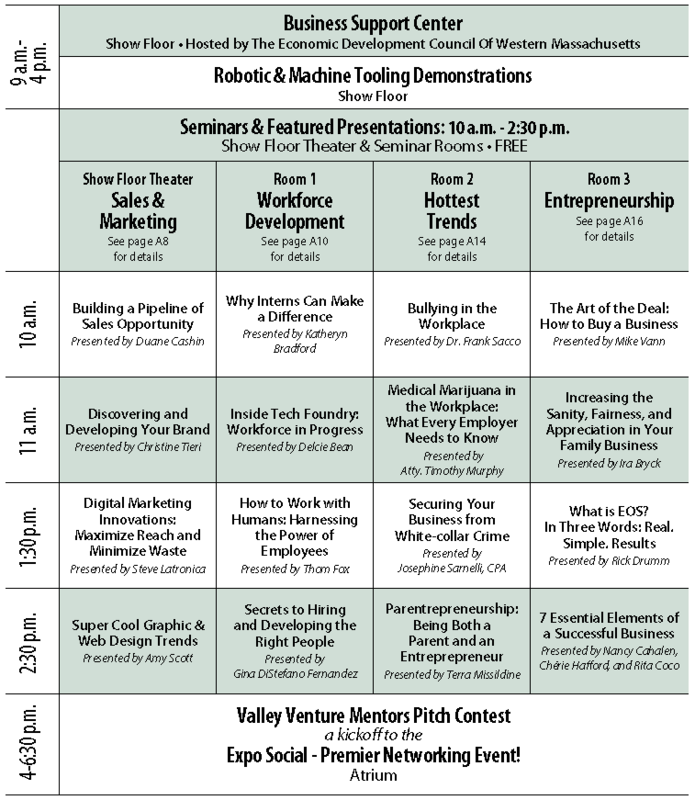 Also slated are robotics and machine-tooling demonstrations, a Technology Corridor, a Business Support Center, the ever-popular Pitch Contest staged by Valley Venture Mentors, the day-capping Expo Social (always a great networking opportunity), and much more. This show was created for you, the hardworking people who shape the region’s business community. We hope you will join us for what will be a memorable day. The fourth annual Western Mass. 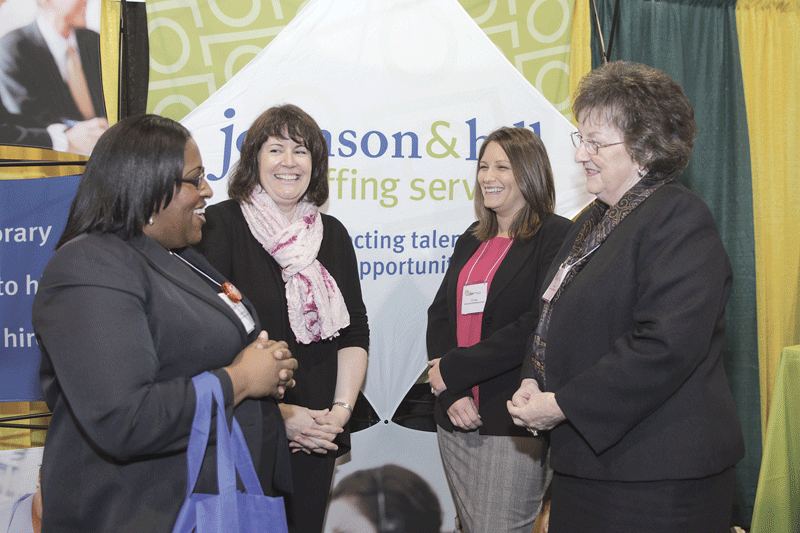 Business Expo, produced by BusinessWest and again presented by Comcast Business, was staged Oct. 29 at the MassMutual Center in downtown Springfield. 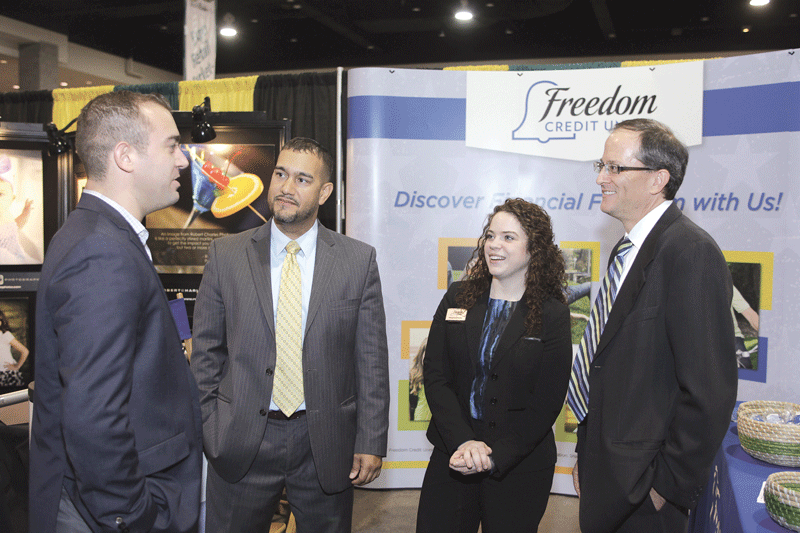 More than 2,000 attendees passed through the doors, and they had the opportunity to visit more than 150 exhibitor booths, stroll the new Retail Marketplace, take in more than a dozen educational seminars, and watch several presentations on the Show Floor Theater, ranging from a discourse on overcoming one’s fear of public speaking to an update on the next-generation space telescope. The day’s programming started with a keynote address from Gov. 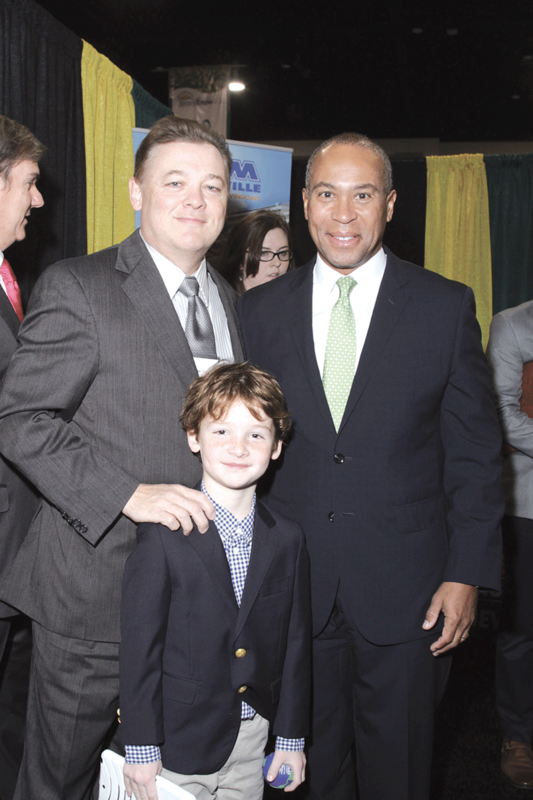 Deval Patrick at the ACCGS kickoff breakfast. Later, Patricia Diaz Dennis, retired senior vice president for AT&T, presidential appointee to the Federal Communications Commission, and member of the MassMutual board of directors, was the keynote speaker at the luncheon program presented by the Professional Women’s Chamber. The day was capped off with a pitch contest by Valley Venture Mentors and the popular Expo Social. Below is a photographic look back at the Expo. Watch the video here. Tia Allen, Sharon Marshall, and Tim Steffen of Northwestern Mutual chat with Ryan Bouvier of Pioneer Valley Indoor Karting and Wilder Gulmi-Landy and Justin Roberts of American International College. 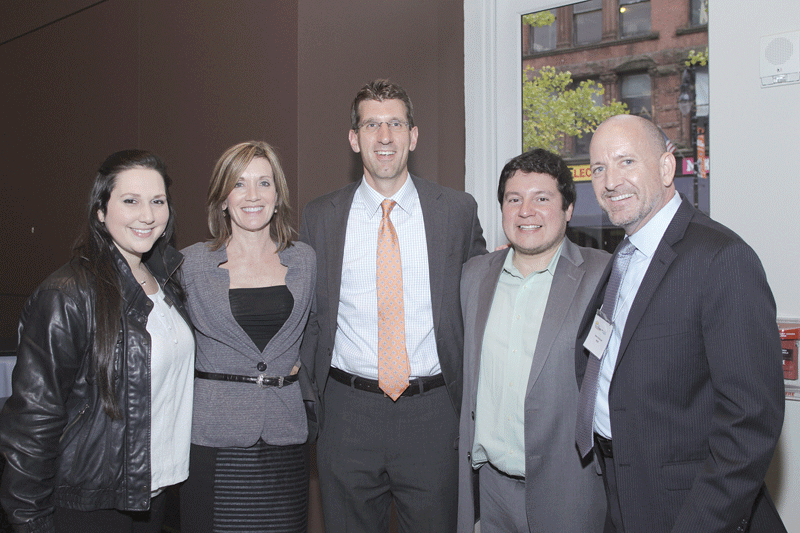 Kenneth Anderson from HazCommpliance, LLC and Joanne Gruszkos from MassMutual Financial Group. 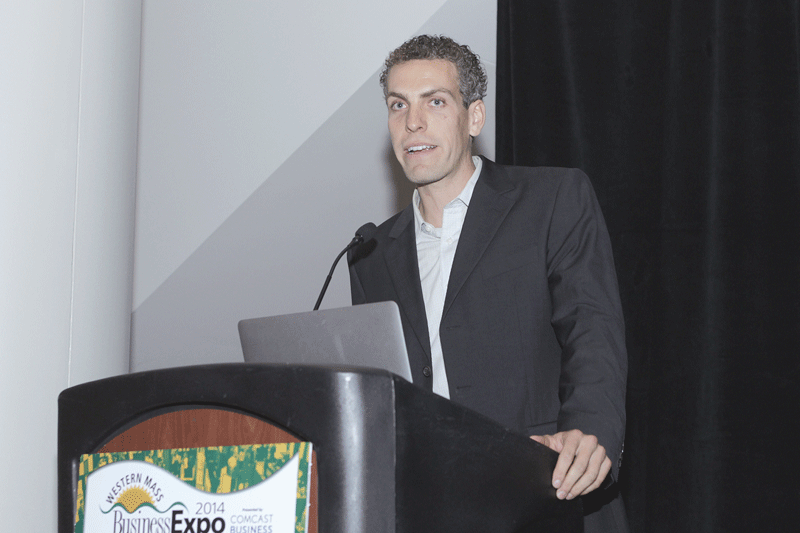 The Expo featured a wide range of seminars and special presentations on the Show Floor Theater, as well as lively breakfast and lunch programs that gave attendees plenty to see, learn, and do. 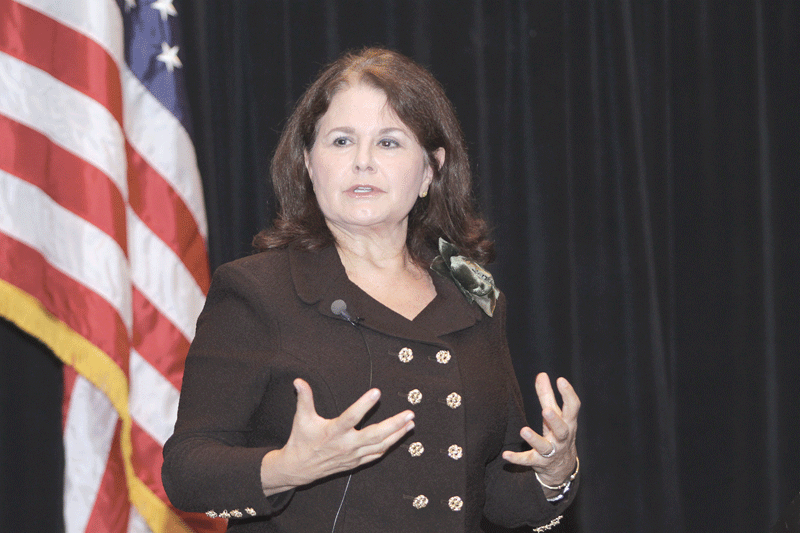 Patricia Diaz Dennis, retired senior vice president for AT&T, presidential appointee to the Federal Communications Commission, and member of the MassMutual board of directors, presents the keynote address at the luncheon program presented by the Professional Women’s Chamber. 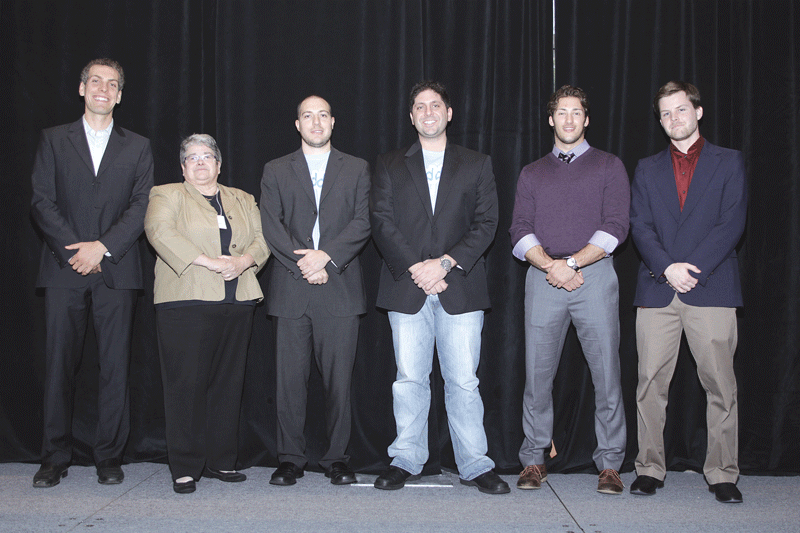 Valley Venture Mentors and BusinessWest invited VVM alumni and members of the current class to apply for a spot in the second annual Pitch Contest and Demo Day. The participating startups — Artifact Cider Project, Caswell Communications, CloudContacts, Nudger, and Piddx — made two-minute pitches to a panel of judges who offered immediate feedback. Pitch Contest winner Jake Mazar, developer of Artifact Cider Project. 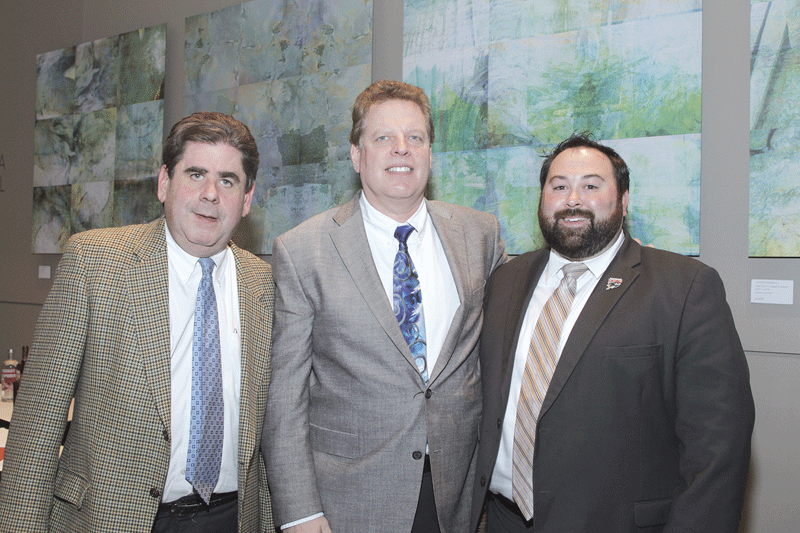 Harry Georgiades and Bob McNamara of McNamara Waste Services with Chris Thompson of the Springfield Falcons.